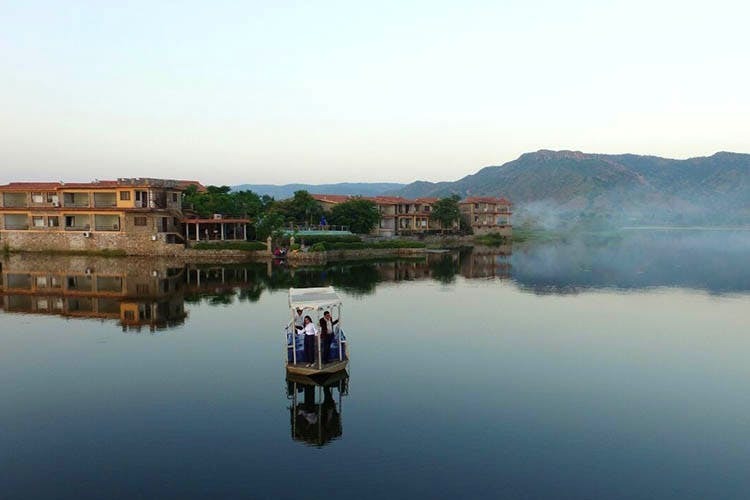 About 50 km from Udaipur, is the beautiful village of Jhadol with a luxury resort fit to serve kings. The Jhadol Safari Resort, owned by the Jhala Royal family is a beautiful property by the lake and is great for spending quality time with your loved ones. Each room has private balconies overlooking the lake, a view that can be taken in from the tubs in the bathrooms too! The buildings have a rustic, cottage feel with spacious, plush rooms inside making it the perfect place to enjoy the peace and quiet of the area around. You could also cool down in the infinity pool overlooking the lake or share stories around the bonfire at the resort. The hotel restaurant, in addition to its regular dishes, also serves traditional delicious Rajasthani food that'll satisfy you to the core. The resort also organises birdwatching tours with experts, picnic lunches in the forest, photography trails and biking tours around the village. There are also many local festivals and fairs that take place around the year which are a great way to acquaint yourself with the culture and lives of the tribes living in the area. A great time to visit this resort is in the monsoon when you can enjoy the beautiful lake at its fullest. The charges are a bit high. To give you an idea, a deluxe room costs about INR 14,000 plus taxes for two nights without breakfast.